Good morning! Now that the hoopla is over, I am embracing my slow days and reacquainting myself with forgotten knitting projects. Some on the needles and some in my imagination. The imagination ones can be the best. I LOVE the striping of my cowl. However that stockinette I craved during the weeks leading up to the wedding is super boring now. I thought you'd like to see the never ending sock blanket, I love it and so does everyone else. I haven't worked on it these hot summer days but every once in awhile I do an hour's worth of knitting before the heat of the wool over takes me. I am dreaming of cool autumn days of snuggling under this mammoth and knitting away. Those days are coming! Dear sweet Stella, my Maggie Rabbit that my sister made for me, has been patiently awaiting a sweater. I must start one before the cold weather starts. I dug through my scraps and odds and ends and found this sock yarn left over from my first hitofude cardigan. We can be matchy matchy! Of course I'd like to start some shawl knitting but for now I have plenty to keep me happy. 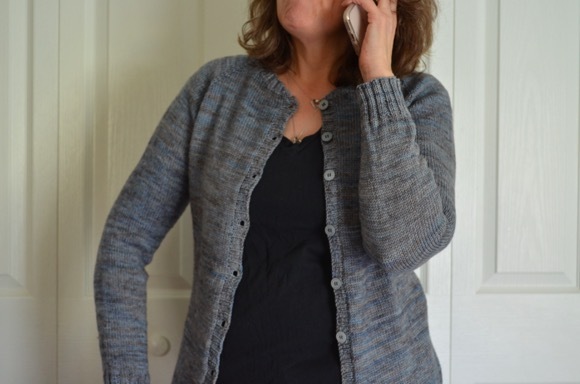 Tomorrow I'll share with you the featherweight cardigan. The sock blanket makes me swoon, it is just so perfect!! I have some socks knit from that same type of yarn, and they have held up! That sock-yarn blanket is really something. It is going to be fabulous to snuggle in when the temps drop. Where do you find a pattern for a sweater for a stuffed bunny?? I love seeing all of your knits! They are gorgeous! so fun about the knitting! I adore Maggie Rabbit. I just bought a couple of those kits for my bestie (the bunnies...). The blanket looks beautiful. How much bigger will you go? And the cowl...well...I love. Gosh, your knits are beautiful Karen! Love the cowl, and the sock blanket is amazing!!! Happy knitting! Such beauty in all your projects!!! Ohhhh The cowl reminds me of that baby blanket I'm knitting. A tube...with colorfulness. ! So glad you have some slow time again. Looking forward to those cooler days to snuggle up and knit! These all look lovely. I'd love to knit a cardigan for a maggie rabbit but have yet to make a rabbit. I have recently ordered one of Alicia's embroidered sampler patterns though and can't wait to start that. Can't wait to see the featherweight cardigan. I just love the shading on your cowl so keep going at that stockinette! :D I still haven't managed to make a pair of socks in my life but have some planned for my husband for his birthday - very excited to see if his last so well as yours as he's always putting holes in his shop bought ones! Looks like you have some great things lined up! It's always a bummer when a good sock yarn gets discontinued-I'm glad you have one last ball to squeeze another pair from! I love the green for your rabbit's sweater-she's going to look so nice! I do love your sock blanket Karen, it really is a work of art. And your cowl! I knew it was going to be pretty, but it's even prettier than I imagined . I picked up yarn today to knit Porter a little cardigan. I love the sock yarn blanket. I love the colors in it! Since I don't knit socks that often I don't have the much yarn, but I do separate my scrap yarn into certain boxes for projects just like this! I also love the sock yarn blanket. One day I hope to make one too! Love the blanket! One of these days I'm going to start that project...... That Regia should make a fun pair of socks! 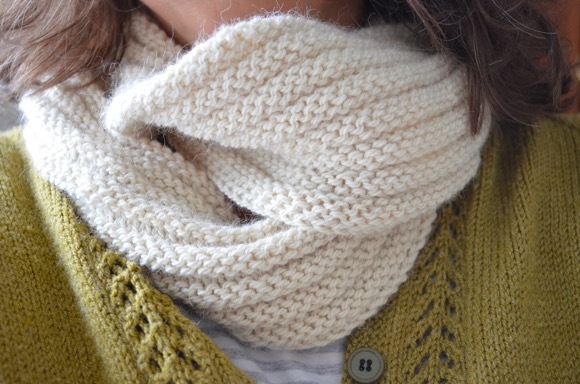 I love how the colorway is knitting up in your cowl, Just stunning, and the blanket... amazing. It's gonna be a big baby. hehe. I like your term "Imagination Knitting" -- seems this is what most of my knitting is these days! That blanket is SO IMPRESSIVE! And I also love the stripes on your cowl!